Source: Greenwich Graphic. July 1, 1899. Up on a hill overlooking its more pretentious neighbors stands the home of Milo Mead, known as the sage of New Lebanon. The immediate locality is known as Byram and Byram Shore. Just over the river is Port Chester in New York State. This section of the town goes by a number of names, some of it is called East Port Chester, by new residents Hawthorne, and Mr. Mead has given it the name New Lebanon. To the stranger all these names are puzzling and we doubt if there is a spot of the same size in the State of Connecticut that is burdened with so many appellations. The Post Office is called Hawthorne but most people when they write to residents of this quarter of the town address their letters East Port Chester. Perhaps no other person has done so much for this locality as Milo Mead. Years ago in _____ of his house there were but vacant fields and woods which belonged to farms. He could stand, when he was a boy, on the piazza of his house and his view was unobstructed by dwellings; his house was far away from any other. To-day he can look from the porch and an entirely different scene presents itself; houses have built all around him except to the westward. Beautiful and costly residences have been erected and there is a large growth in population and the summer homes of many wealthy men are located within a stone's throw of his house. And this group is of a substantial nature representing all classes, as well as men of wealth, intelligence and prominent in the world of business. Mr. Mead is a man of public spirit and has been deeply interested in this growth. Instead of turning the cold shoulder to new comers and giving them the impression that he preferred to so, far as he could, keep things in a primitive state, he has extended the hand of welcome to all who desire to buy property in that section and locale there. He has helped many men in times when help was needed in business ways. His advice has been sought for repeatedly and he has hand in his pocket in many cases where he was asked for aid, perhaps too much so for his own financial good. He called the place New Lebanon because he thought that East Port Chester was too much associated with Port Chester which is in New York State and the name New Lebanon that was suggestive to him of a beautiful spot. There is a New Lebanon Opera House, New Lebanon Drug Store, New Lebanon Market, New Lebanon Carpet Beating Factory, and other business enterprises are named from the place. The improvements about the locality seem to be his hobby and he takes great pride and interest of the people of the place. He has erected several shops and offered their use at ridiculously small sums in order to bring trade to New Lebanon. He said to the GRAPHIC the other day, "I don't want the people to go to Port Chester and trade. The money should stay here if we can keep it here. This is Connecticut and not New York State, and we ought to patronize our own people." He is not a narrow man, but broad in his views, but he will not allow liquor to be sold in any of his buildings. The Byram road leading to the shore was recently widened fifty feet at his expense, and other thoroughfares have also been improved and straightened by him, and in some cases he has cut the street through land at considerable cost to himself. The people of New Lebanon and that locality all speak of him very highly. He lives in the old homestead where he was born and which commands a most beautiful view of the Sound, up and down. The improvements he has made about New Lebanon cannot fully be enumerated and the value of what he has done for the town in that locality is inestimable. He has seen the elegant residences which are in front of his house along with the shore erected. They are owned by Mr. C.R. Mallory, Mrs. H. Mallory, Mr. Robert Mallory, Mr. W. J. Tingue, Mr. Jon McClave, Mr. James H. Hunt, Mr. Peter F. Meyer and others. Mr. Joseph Milbank is now building opposite Mr. Mead a very elegant mansion, which, it is said, will be one of the handsomest along the Sound. It is on the property once owned by Mr. Starbuck. The old house presents a quaint and picturesque appearance way up on the hill and suggests the past. It is so high that the view from it can never be obstructed to any great extent. There were three of these charming locations in Greenwich which were selected and built upon by the Mead's. 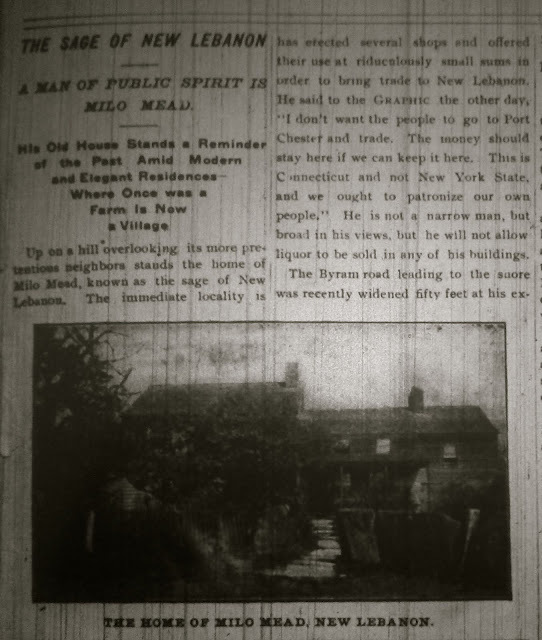 One is what is known as Charles Mead's Point, the second, Field Point, where lived Oliver Mead; the third is the home of Milo Mead. They afforded not only beautiful sites for homes, but were near the Sound, which gave them benefits to be derived from the nearness to the salt water. Then they had many acres of fertile fields for farms. The old house was built by a Mr. Close some time before the Revolutionary war, and is at least one hundred and fifty years old. Mr. Mead's father bought it of Mr. Close, and Mr. Milo Mead has always lived there. About seventy-five or eighty years ago an addition was made to it. It is better preserved that many of the old houses about Greenwich, for Mr. Mead keeps it in good repair. To compare it with the modern house across the way would be like placing the old lumbering stage coach alongside the Saratoga flyer. But yet with it quaintness and age there is a feeling of quietness and rest which comes over one when passing in its doorway that is refreshing after one has been through the modern and elegant dwellings which are its neighbors. It's the difference between the electric light and the tallow candle.